Last night I turned simple pheasant-fare ingredients into a mouth-watering, upscale delight. Here’s a quick rundown of the meal. The sauce: olive oil, dried crushed red pepper flakes, 3 cloves crushed garlic, a large pinch of fresh rosemary & basil coarsely chopped, medium yellow onion half-chopped half-sliced into slivers, 28oz can organic chopped tomatoes. In a medium sized pot warm about 2 tbsp olive oil. Add onion, garlic and dry red peppers, stir frequently until onion becomes soft and translucent. (If you have a little wine laying around -red or white- douse the onion/garlic mixture with a generous splash!! Mmmm mmm good) Add the tomatoes and the rest of the ingredients and bring to a boil. Rinse the can with a bit of water and pour into the sauce too, don’t worry, evaporation happens so it’ll still taste great! While the sauce is cooking chop and wash your spinach, slice a couple cloves of garlic and slice a few baby bella mushrooms. Also, slice the polenta into 1/2 inch thick rounds. If you are not familiar with polenta, it’s a fat free, gluten free product made with yellow corn meal. It comes in many varieties, some like a cream of wheat, and others in compressed rounds, like the one pictured. I like this polenta… (click) but any wholesome brand will do. As the sauce nears completion and all of your other ingredients are prepared, it is time to whip up the rest of the meal. Sauté the spinach and garlic with some olive oil. In a separate pan cook the polenta slices in a bit of olive oil, and toss the mushrooms in the side of the pan to heat up a bit too. 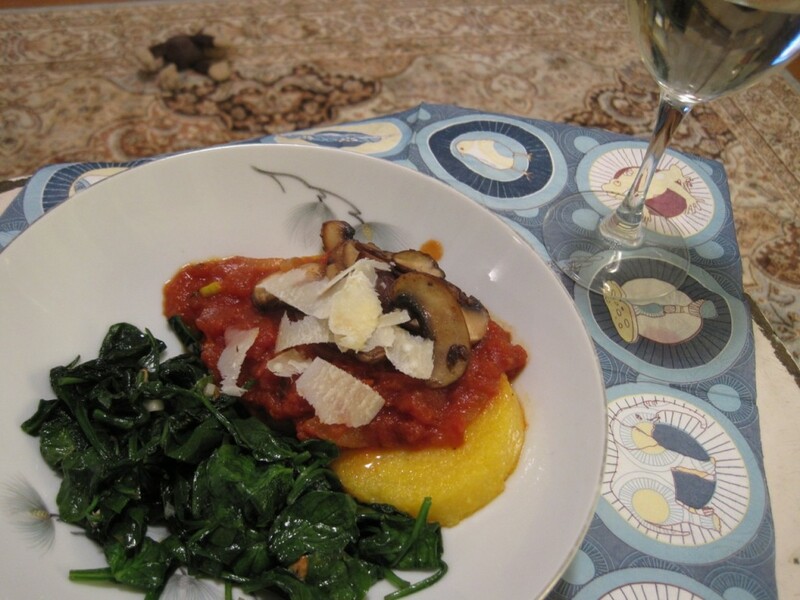 If you prefer a lower fat approach, the polenta can be baked in the oven on a parchment paper lined baking sheet. Serve as shown, with a little Parmesan on top. 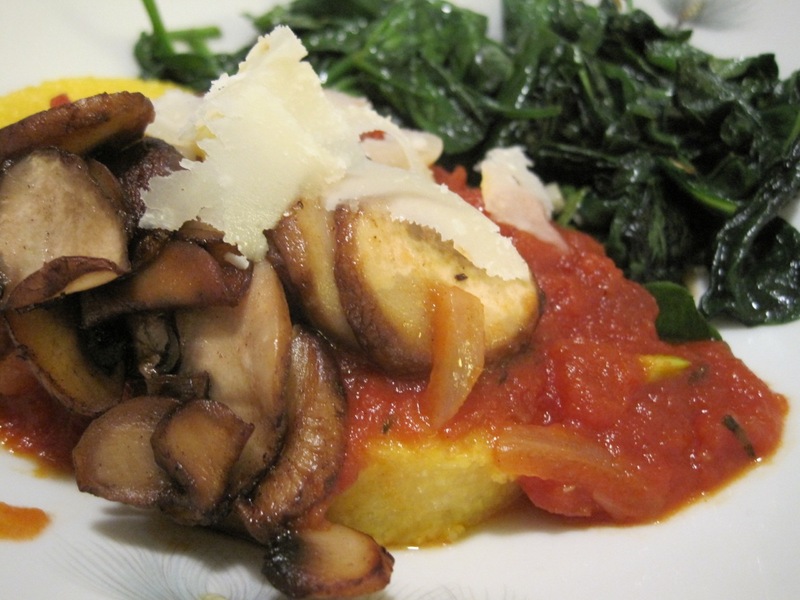 March 23, 2011 | Filed under dinner, vegetarian and tagged with Italian, mushrooms, polenta, spinach.